Ocean acidification owing to anthropogenic emission of CO2 is a significant and imminent threat to marine calcifying organisms and ecosystems such as corals and coral reefs. As a result of future ocean acidification, i.e., increasing seawater CO2, and decreasing pH, carbonate ion concentration [CO3], and carbonate saturation state, it is likely that marine calcifiers will have difficulty growing their shells and skeletons of calcium carbonate (CaCO3) at their present rates. Dissolution of carbonate sediments and structures are also likely to increase, and could ultimately exceed calcification and CaCO3 production, leading to a transition from net accumulation to a net loss in carbonate material of individual coral colonies, coral communities and coral reef ecosystems. Because of Bermuda's relatively high-latitude location (32° N), the annual average surface seawater [CO3] is lower in Bermuda than regions closer to the tropics. As a consequence, the Bermuda coral reef is likely to experience critical [CO3] values and net dissolution before its tropical counterparts as a result of continued ocean acidification. Furthermore, a natural gradient in [CO3] exists along the Bermuda reef with environmental parameters such as, light, temperature, and nutrients being near identical. This gradient allows for unique cross-comparisons of calcification of individual calcifiers and calcifying communities under different [CO3] in a natural environment. In this study, researchers at the Bermuda Institute of Ocean Science (BIOS) will launch the BEACON project to further our understanding of the consequences of ocean acidification to the process of calcification and CaCO3 production at three different spatial scales including (1) individual coral colonies, (2) local reef communities, and (3) regional coral reef ecosystems. They will conduct (1) in situ and in vitro experiments to assess growth and evaluate net calcification of individual coral colonies of three different species common to Bermuda and the Caribbean exposed to different [CO3] under both natural and controlled experimental conditions; (2) diel and quasi-lagrangian calcification experiments to evaluate net calcification of local reef communities and in moving water masses along the natural [CO3] gradient existent on the Bermuda platform; and (3) time series data collected across the Bermuda platform and offshore, to evaluate net calcification and CaCO3 production of the Bermuda coral reef ecosystem and platform over seasonal and annual cycles. Broader impacts: This project will provide fundamental data on the consequences of ocean acidification to coral reefs on different temporal and spatial scales. Combined, knowledge at each of the scales will contribute to an improved understanding of this problem in a broader context, i.e., the effect on coral reefs as a global entity and role in the global carbon cycle during past, present and future seawater chemical conditions. As the meaning implies, the research team envisions BEACON to serve as a guiding light to assist researchers and policymakers in framing future strategies and making decisions regarding the management of coral reefs and CO2 emission policies in order to establish CO2 stabilization targets. Scientific understanding and research products from the project will be specifically used in the BIOS explorer program, CoE POGO ocean acidification module, and the coral reef ecology class taught at BIOS. It will also contribute to developing the research and technical skills of one graduate student and one research technician at BIOS, and will include the involvement of interns and NSF REU fellowship students each year of the project. Based on the findings of the BEACON project, and especially the results published in Andersson et al. (Nature Climate Change, 4, 56-61, 2014) and Yeakel et al. 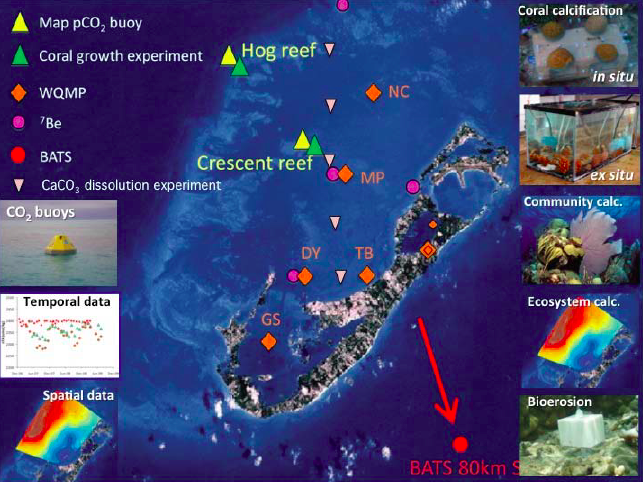 (PNAS, 112, 14512-14517, 2015), BEACON II (https://www.bco-dmo.org/project/737955) aims to assess the links between offshore and reef biogeochemistry by continuing and expanding on the physical and chemical measurements on the Bermuda coral reef and in the surrounding Sargasso Sea.